I posted this yesterday, seems the thread disappeared??? You've got my vote! !! Where'd the wagons come from? Superb stuff! Producers of the various components? The carts and the wagons are from the Perry WotR range (I have a few of those waiting for assembly). 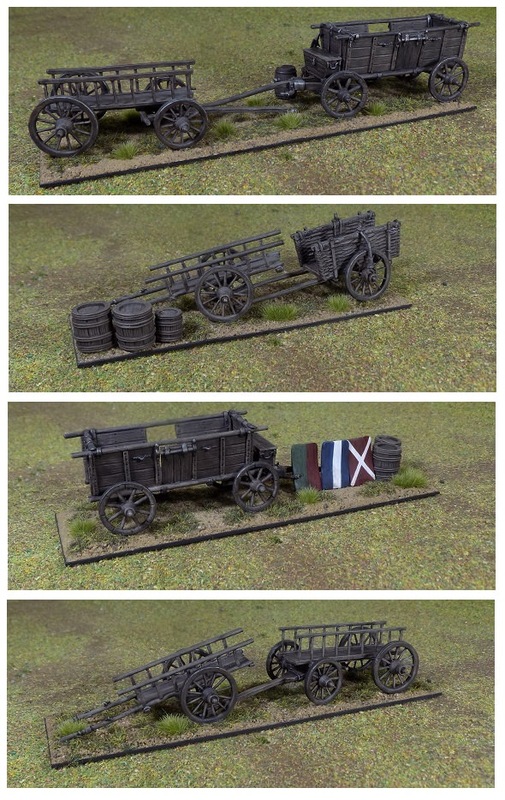 The wagons are available both with and without horse/ox teams. Not sure about the other components, though the barrels look a bit like the plastic barrels from Renedra. Yes, the wagons are from Perry. The larger ones you can get without horses & crew, but the small ones you can't, so I have several spare horses and wagoneers. The plastic barrels are from Renedra. There is one metal barrel there which came with the Old Glory organ gun. The pavises are from Front Rank. Are the figures Perry plastic HYW? No, they are a mixture of plastic and metal figures from the Perry WotR and European armies, plus a few metal figures from the Crusader WotR range. The larger ones you can get without horses & crew, but the small ones you can't, so I have several spare horses and wagoneers. I have a feeling that you will eventually find some use for those horses and wagoneers. 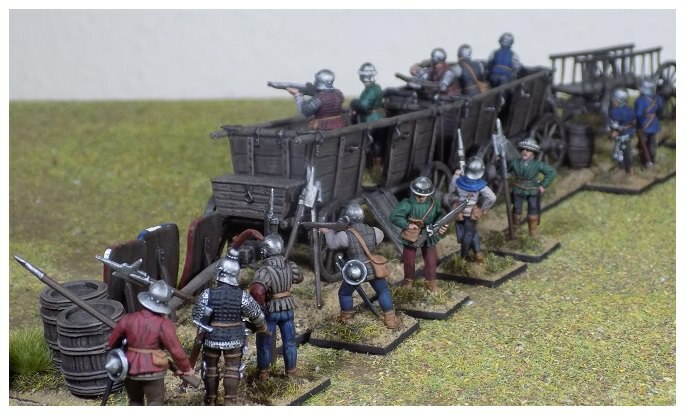 I presume that you also have somewhere the sitting wounded that come with one of the carts – those have excellent potential for mini-dioramas (to be used as markers), possible mixed with the Perry casualty pack. Yes, I'm planning to combine some of them with the water wagon for a little diorama to place behind the defences, exhausted/wounded soldiers dropping back to get some water. The armoured crewman from the bombard with his helmet off will fit in there nicely too. The armoured crewman from the bombard with his helmet off will fit in there nicely too. If you need another similar figure, Perry pack EA18 (Carroccio figures) has a billman standing with helmet in one hand. Awesome…this is really impressive! I love the scenes you've made with the photos too!